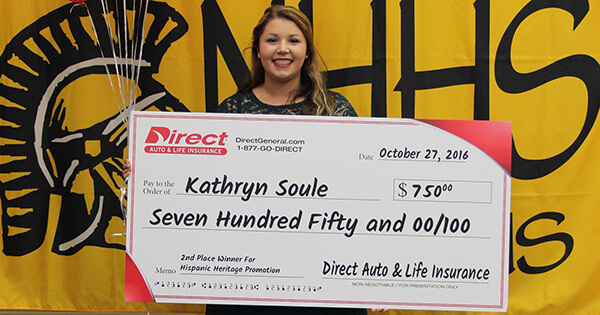 We are proud to announce the winners of the 2016 Outstanding High School Student contest at Direct Auto & Life Insurance, part of our annual Hispanic Heritage Month celebration. Please join us in congratulating Deborah Cuellar of San Benito, Texas, Kathryn Soule of Columbus, Mississippi, and Abraham Cruz of Mission, Texas! Hundreds of nominations for outstanding high school students were submitted both online and at Direct’s more than 400 store locations during the month of September. Each of the three finalists was selected based on how they excelled in the following areas: academic performance (GPA – B average or better), extracurricular involvement, and leadership qualities. Take a moment to learn a little more about these students below. We think you’ll agree they are truly outstanding! Described as a natural born leader, Deborah holds leadership positions in the National Honor Society, student government, and on the school dance team—all while maintaining a 4.0 GPA. This summer, she embarked on a service trip to a Costa Rica where she stayed on a small farm and served the surrounding community. Deborah hopes to pursue a career in chemical engineering as a first generation college student. In addition to serving as president of the Beta Club, vice president of Student Council, and vice president of her senior class, Kathryn is also a member of the Robotics and Rocketry teams at New Hope High School. Her extracurricular activities include visiting with hospice patients several afternoons each week and teaching karate as an assistant instructor. As captain of the Ready Writing team, president of the National Honor Society, and a member of the varsity football team at Sharyland High School, Abraham is able to balance his many responsibilities successfully. He plans to one day become an international business ambassador.